Window exhaust fans are great. They can fill in the gap of an AC (to some degree at least). But when it comes to bathrooms, these fans seem out of place and bulky. You need a special breed to take the stale air out of there. 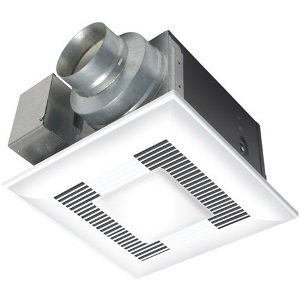 Enter the “Ceiling Mounted Ventilation Fans.” Especially, Panasonic FV-11VQL6! If you want a fan that delivers good on the promises, Panasonic is the brand to look into. Also, this little machine blends in seamlessly with the interior of your bathroom ventilation system without taking up bulk space. It becomes a part of the ceiling rather than sticking out like a sore thumb! The reason for me to choose to review this device is quite simple. It promises benefits and then delivers. Also, it is quite light on your wallet. You’ll still have expenses for a ride home after you buy this fan. Want to know more? Give this article a thorough read. Want a Convenient Design? You Got It! Do you know, Panasonic puts in 20 years’ of legacy within their products? The do! This bathroom exhaust fan is no different. You won’t even notice how seamlessly it blends in with the bathroom ceiling. You can build an entire ventilation network around it. This mean machine comes with 4-inch and 6-inch ventilation duct adapters. This tells you how much versatile this thing is. If you are wondering what will these duct sizes do, well these allow users options. If you want to run this fan for a long time, go for 6-inch ducts. For shorter runs, 4-inch ducts are okay. Then you have the “Double Hanger Bar” system. It lets you position or set up the ceiling mountable fan in any position you want. One can extend the bar up to 24 inches. 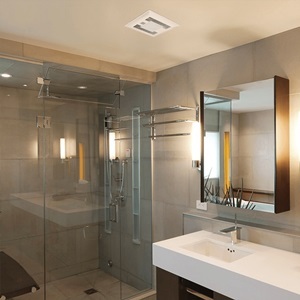 With these bathroom exhaust fans, you can get tremendous air flow at best. But Panasonic goes beyond the conventional method. The FV-11VQL6 comes with two CFL lamps. These lamps do a world of good to your bathroom by lighting them up during night time. These twin lamps provide you 13W worth of power each. Also, these are self-ballasted. So, you don’t need extra bucks buying added things. On top of that, people have a GUI24 base with these lights. They won’t come off that easily. I’m not done yet. Manufacturers have put in a night light too. This is done just to add the extra touch of elegance that people crave from these accessories. Believe me, I am not kidding when I say, “Noiseless.” Exhaust “Ceiling-mounted” fans produce less noise by default. Even then, the FV-11VQL6 goes above and beyond. How? Well, this thing is practically noiseless. I am reviewing the 110 which drives out CFM (Cubic Feet Per Minute) of air. So, one can expect the motor to be slow and produce less sound. In fact, you get the sound level rating of 0.5 Sones. If you guys don’t know, this means your machine is very quiet. You can now enjoy bathing and your alone time on the loo without distractions to worry about. This Little Fan Saves Energy and Bills! To be honest, all of the Panasonic products exhaust fans are. The FV-11VQL6 has received Energy Star certification indicating its efficiency in power saving. Having one means that your fan complies with the rules and regulations of the US Environment Protection Agency or the EPA. Thanks to this, people know that they’ll be able to cut down on electricity bills in the long run. I’m not boasting but you can definitely see a downward spike in the bills’ graph after beginning to use this tool. It is Safe – Today, Tomorrow, Forever! As you know, this 110 CFM fan operates slowly due to the low CFM rating. As a result, the RPM count of the motor is on the lower side too. What this does is lowers the possibility of the fan heating up. Further lowering the possibility is the fact that Panasonic FV-11VQL6 uses a condenser in the motor. This doesn’t usually let the temperature rise beyond a certain point. Besides the “Energy Star” certification, it has managed to attain LEED, ASHRAE 62.2, and CA Tile 24 Certificates. All these things make it compatible with various conditions and situations without a hitch. As a result, you are never at risk of any health hazards. The design is unbelievably simple. It guarantees longevity and top-notch performance. This fan has proved to be noiseless with 0.5 Sones’ rating from the professionals. The FV-11VQL6 is suitable for using in normal houses and houses with tiles in CA. This thing is safe. You can tell by having one look at numerous certificates denoting the same. I saved a significant portion of my electricity bill thanks to this device. It is EnergyStar certified. The main problem is the lifespan of the lights for some users as they stay around for 1 – 2 years. The Night Light shines straight down and doesn’t illuminate the surroundings that much. The undeniable fact is that quality has its price. Yet, people hesitate to put a few bucks into the purchase. I think it’s fair since you are buying an exhaust fan for only one purpose. That is, expelling stale air. Or is it? Nowadays, these fans even have light stands and nigh lights built into them. If you want these perks, you NEED to pour some sugar into the deal. 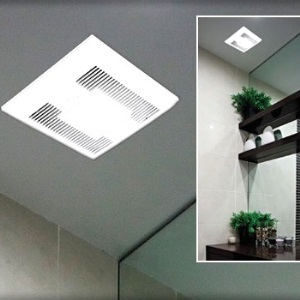 As you know by now from my review of Panasonic FV-11VQL6 Ventilation Fan/Light Combination device, it is the best within the “Low-to-Medium” tier of bathroom fans. People have the perks of controllable speed, corrosion resistance, and lamination at their disposal. This thing is quite safe as well. Right from the galvanized casing to the condenser motor, you have multi-stage safety precautions. Yes, this draws lesser air than a few alternatives. Yet, I recommend it for the added perks that come along.